Today was the June RaDAR On-The-Air Meetup. 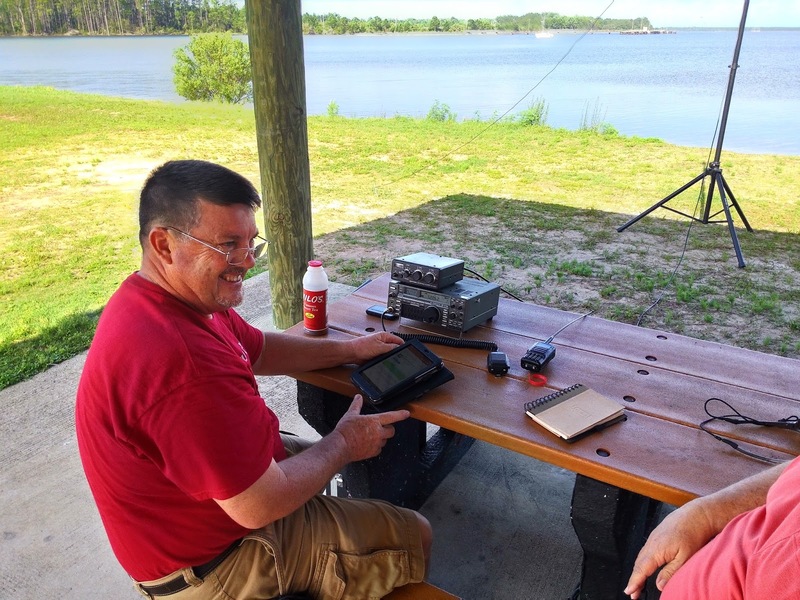 There were several Panama City ARC members setting up portable stations at a park by the bay in Lynn Haven, Florida. I used this opportunity to test the core of our outside station for the upcoming Field Day at the Bay County EOC. The station included the Icom 7100 powered by a 40 amp hour LiFePO4 battery. The battery was being charged via a 100 watt solar panel. The antenna is a 40/20 meter fan dipole. The center is supported by a mast made of camo poles with a tripod base. It is 24 feet high. The dipole ends were held up by four 31 foot Jackite poles. The poles were strapped to three foot angle iron pieces driven one foot deep. I ran 100 watts. 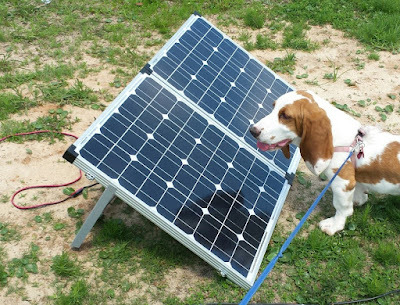 The rig pulled 8.5 amp hours out of the battery and the solar panel put 6 amp hours into the battery during the meetup. The first hour was 40 meters. On SSB I worked K4LIX first. Jim was in the park with me. Then I worked Don KK4QAM in Sweetwater Alabama from the RaDAR Community. This was followed by KK4DIV Bob setup next to me. Then Jack N1HQ who was in Panama City, The last SSB contact was Cory N4UVR in the park. On to CW I worked K4JYS running vintage gear from North Carolina. Next was N1ZX Stan in Stuart Florida. The second hour was 20 meters. My first contact was a surprise K4FUS Fernando nearby. I did not know he was operating portable. I finished out the SSB contacts with VE3LYX Don, W8BOX Tom in Ohio and KE8AQW Michael in Michigan. On to CW i worked Bob WB4BLX right off the bat, he was at his home in Panama City. I was picked up by the SKCC Week End Sprint ops. I worked K9JWV in Utah, KA3OCS in VA, WB0CLL in Oklahoma, K0LUW in Nebraska, K9JWI in Indiana and NS3C in California. I would say this setup is going to work fine for Field Day. We should be able to work 15 meters with the fan dipole as well. Suzy the basset puppy did well and greeted the visitors. Here some photos of the other setups.